Judd Apatow’s third film, Funny People, is slow, disjointed, and riddled with long breaks between laughs. It is also something close to an American comedy masterpiece. I don’t mean that this is the funniest American film of all time, far from it. Funny People is decidedly a film about people, but the “funny” in the title is less apparent. Sure, the film is full of laughs, but few of the characters are just plain ol’ silly. This calls into question our preconceived definitions of comedy. What makes someone a comedian? What makes the rest of us laugh? 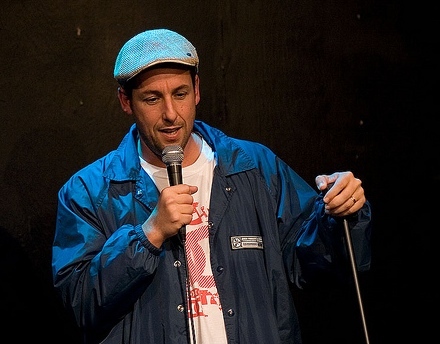 Adam Sandler plays George Simmons, a comedy megastar who tries to get back to his stand up roots after learning he has a terminal illness. Hours after learning of his impending doom, he bombs on open mic night. This spells disaster for the young Ira Wright, played by Seth Rogen, who must follow the dismal act. Ira is forced to face the cooled off crowd with his pile of low- rent jokes, but a couple of cracks at George’s expense gets him noticed by the celebrity, eventually landing him a gig as his personal assistant. Overnight Ira goes from the least successful guy is his apartment of young talents to the right hand man of their childhood hero. Ira’s roomates, Leo Koenig and Mark Taylor Jackson (played by Jonah Hill and Jason Schwartzman, respectively) embody the very definition of platonic love, even though they spend the bulk of the movie violently ribbing their couch- dwelling friend. It is obvious that when they all came to Hollywood, they would stick with one another through the bitter end. Adam Sandler is phenomenal in the lead role; this is truly the performance of his career. His dramatic chops aren’t all that well refined. Try as he might, Mr. Sandler never made the leap from comedy to drama as successfully as, say, Tom Hanks. However, that is precisely what makes him so perfect in this role. George is a man whose spirit has been dampened, beaten down over the years until he only knew how to do one thing: make people laugh at any cost to his pride or his interpersonal relationships. This comedic layer is why a funny behemoth such as Mr. Sandler is required. Anyone could get George’s dramatic overtones right, but a masterful laugh-maker is required to make the comedy work. No one but Sandler could have brought that out as beautifully. Close to the end of the film, after verbally berating Ira, George takes things below the belt and suggests maybe the young comedian should find something else to do with his life. “Comedy, usually, is for funny people.” It is a massive moment. As audience members, we know how to laugh, but what separates us from the comedians is knowing quite how to evoke that visceral reaction from the masses. In plain English, Mr. Apatow’s film explicitly explains what it is that separates the funny from the not, yet we remain as confused by this dark art as we were before viewing Funny People. That we still laugh for two and a half hours in this moving piece is evidence enough that we are willing to put it on faith that these people are, in fact, quite funny.